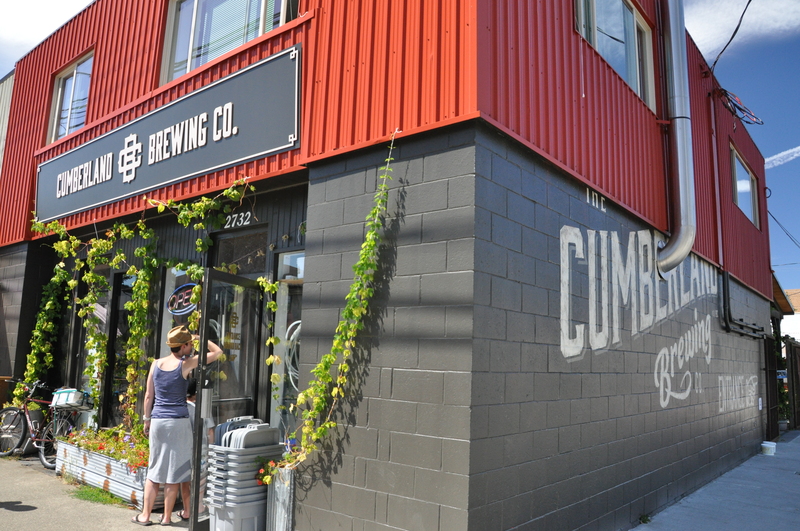 Comox Valley Breweries: Cumberland Brewing Co.
British Columbia is the hottest craft beer market in Canada, so it’s time to explore another new BC brewery. Over the past few weeks, I’ve taken the Wayback Machine to the breweries I visited the summer of 2014. However, it’s time to return to the present — I’m actually on Vancouver Island as I type this, and I have made it my mission to visit the three new breweries that have just opened in the Comox Valley area. 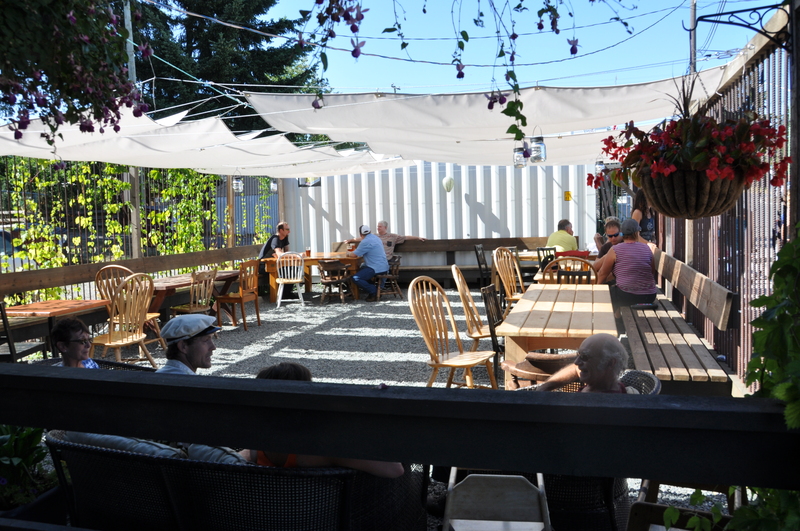 Comox Valley: ocean, mountains, wildlife, and now, craft beer. 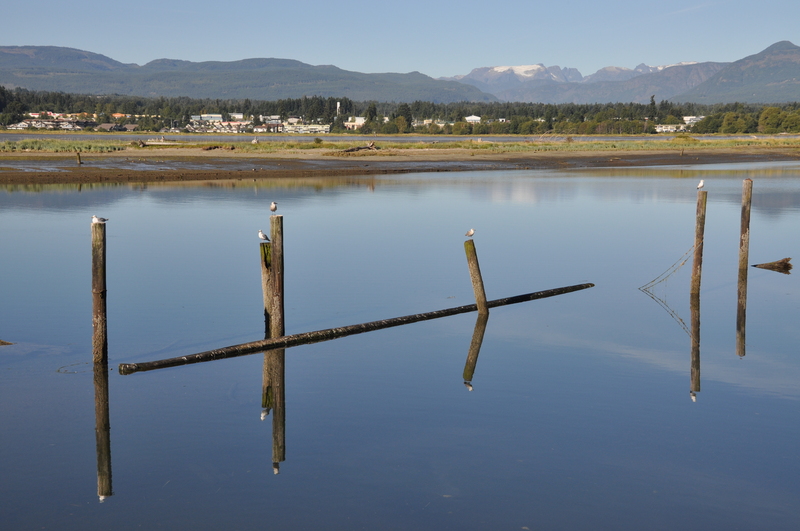 Comox Valley is a large area of fertile land about half way up the mainland side of Vancouver Island. It was originally settled several thousand years ago by Coast Salish who called the area kw’umuxws (“plentiful”) because of the abundant fish, seafood, game and the rich soil. Now it is home to three towns — Comox, Courtenay and Cumberland — and about 65,000 people. It’s a beautiful piece of Canada that has been blessed with ocean, mountains, mild winters and dry warm summers, but little in the way of local craft beer until recently. 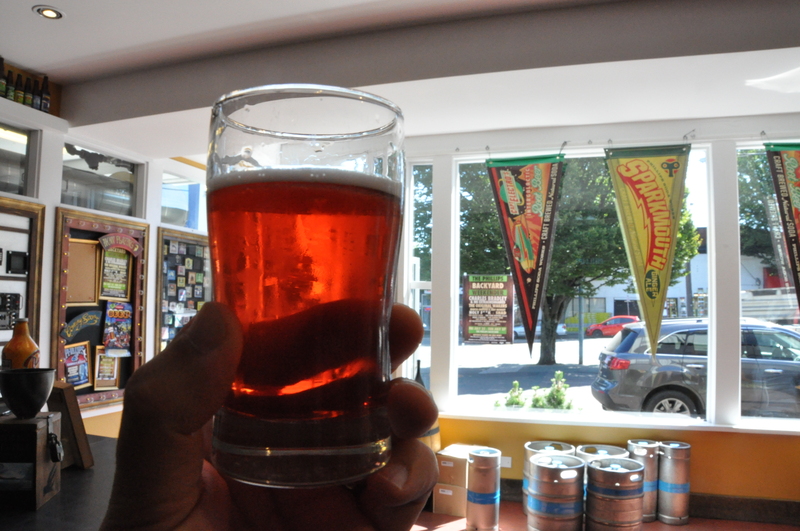 The first brewery on my list today was Cumberland Brewing Co., located in the town of Cumberland. Back in the late 1800s and early 1900s, Cumberland was a happening place due to anthracite coal mining. However, when its major customer, the British Royal Navy, converted their ships from coal to diesel after World War Two, the price of coal plummeted, the mines closed and Cumberland’s population quickly dwindled. Today, Cumberland is a sleepy little town of about 3,500. Well “sleepy” is probably the wrong word. Along the two short blocks that make up the town centre, there are no less than five coffee shops, and they seem to be full of customers all the time. I have no idea what people do for a living in Cumberland, but I’m willing to bet that it doesn’t involve much sleep. As I mentioned in a previous blog, when Elaine & I were on the Island last summer, there were no breweries in the Comox Valley, which was strange. Given the residents’ love of good local food and good wine, the table already seemed to be set for a good local craft beer and yet none was forthcoming. 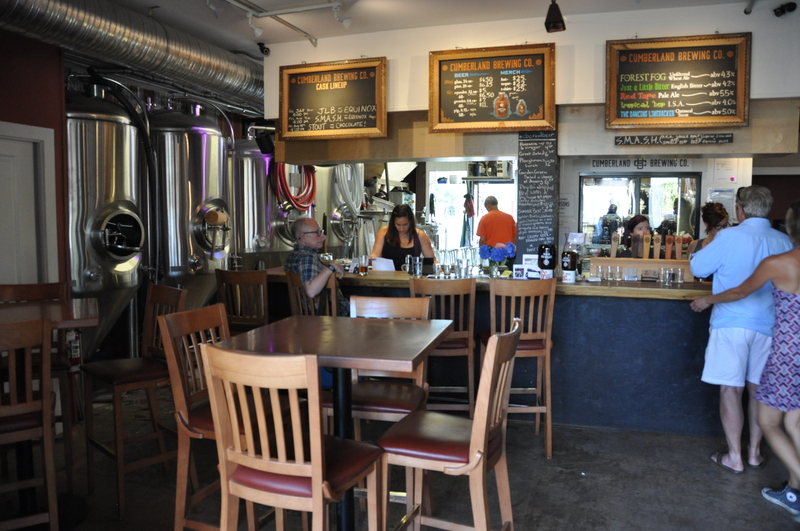 That all changed in December 2014 when Cumberland Brewing Co. opened its doors, the first of three Valley breweries that would start operations within months of each other. We went around to the back of the building, and were met in the tasting room by Darren Adam, one of the founding partners. (His business card says “Sells the Beer”.) Adam has lived in the Cumberland area for several years, and the choice of Cumberland as a location for a brewery seemed a natural one to him. He believes the area’s easy access to various outdoor sports like skiing, biking and hiking is unmatched, and the people who participate in those sports tend to finish their day with a beer. So a brewery seemed to be the perfect new business, especially for a town looking for new businesses. Darren took us on a quick tour of the brewhouse. It was quick not because he was hurrying, but because you could see everything at a glance. The entire main floor of the building is perhaps 1,400 square feet. Take away the tasting area and there’s significantly less than 1,000 square feet in which to make and store beer. So things are crammed in tightly, starting with the two-vessel 12-hL brewhouse, built by Victoria’s Specific Mechanical Systems. To save space, the vessels are heated electrically rather than with steam, which does mean that caramelized sugar has to be cleaned off the heating elements after each batch. As expected with any brewery start-up, there were a few engineering issues in the early days, including a small fire in the brewhouse control panel in the middle of a mash. But once past the initial shakedown period, it’s been full steam ahead, albeit without the steam. 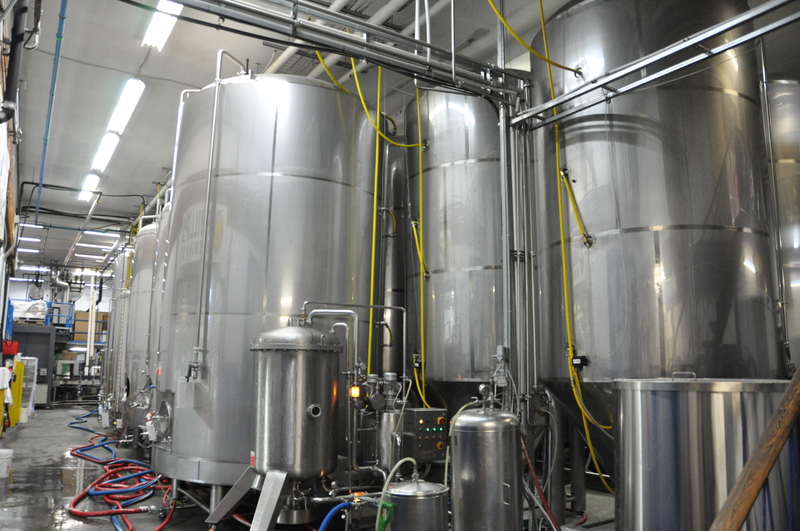 The brewery also has five 12-hL fermentors, each capable of handling a single batch. They actually started with just three, with a projected need for another two FVs in three years. 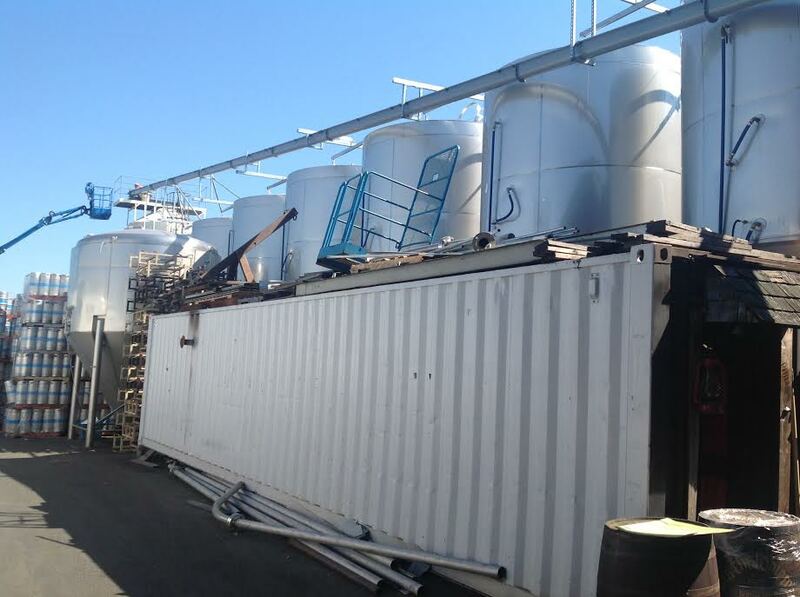 However, demand for product was so high right from Opening Day that they hit their expected three-year production goal after just a few weeks and realized that unless they got at least two more FVs right away, they would always be regularly plagued by dry taps. I also met Mike Tymchuk, the brewmaster. (His business card says “Makes the Beer”). Another of the founding partners, Mike has been a part of the Western Canada brewing scene for many years, having brewed at Spinnaker’s Brewpub in Victoria and started up Wild Rose in Calgary. He had been taking a break from brewing, becoming the chef of an artisanal pizza place he opened with his wife Caroline in Cumberland. However, the lure of creating a local brewery for the community was too strong to resist. The Dancing Linebacker, an oatmeal stout. Cumberland’s business plan is kind of interesting: They have no bottling or canning line, nor do they plan to ever build one. (And to be fair, where would it go? On the roof? Out on the front sidewalk?) No, Cumberland plans to sell most of their beer to walk-in visitors either by the glass or via growler. 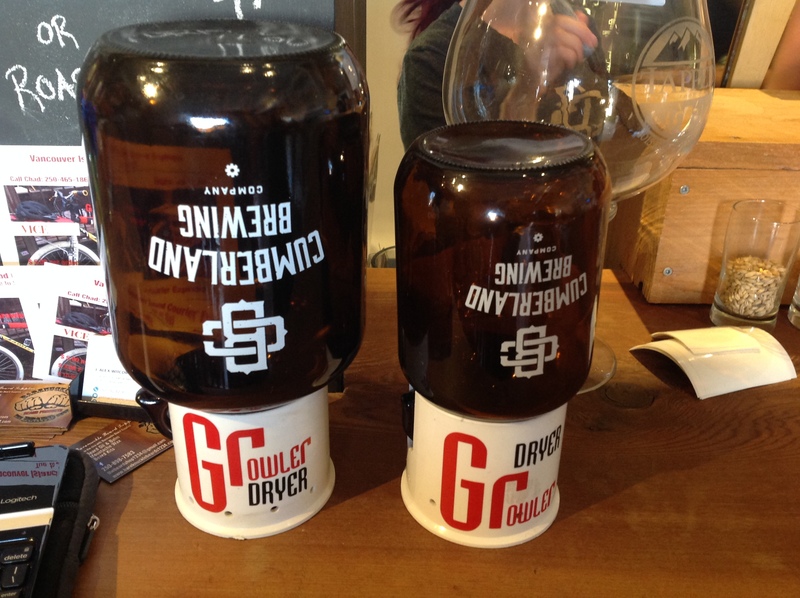 Growler sales have taken off, and apparently Cumberland has several thousand of them out in circulation. Certainly while we were visiting, there was a constant line of people having one or two of their growlers refilled. For a short while, Cumberland also will be filling 8.5-litre “pigs”. I have never seen these plastic pig-shaped super-sized growlers before, and unfortunately, it seems like I will not see them again — the company that has been making them for 15 years has just announced it is shutting down. 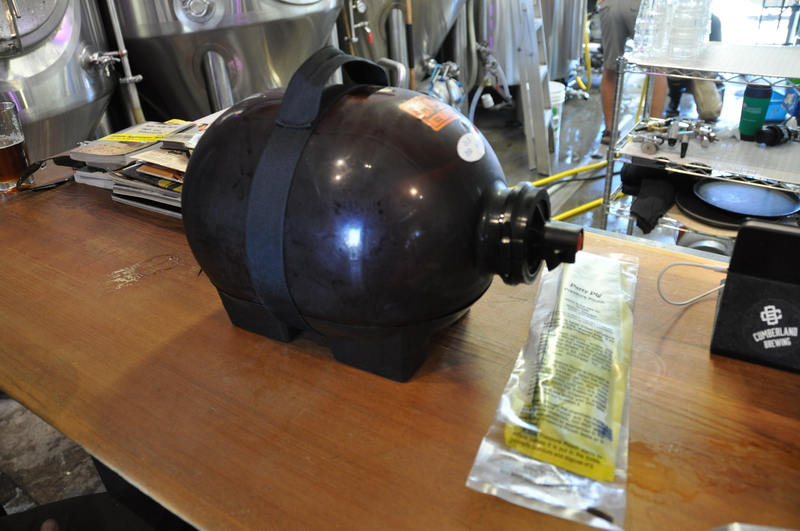 Too bad, it seems to be the sweet spot between a 2 L growler and a 20 L keg. Great idea for a pool party. Cumberland also fills a lot of one-litre containers, which they call “squealers”. (There is no industry standard name for this size — I have heard them called Boston rounds, growlettes, and now squealers.) And they fill a few kegs for some local restaurant and bar accounts in the Valley, but don’t want to look any further afield — the transportation costs and time needed for delivery to destinations outside the Valley quickly erode the economics of the sale. Cumberland (and every other craft brewer in BC) is also feeling pretty good about the latest news from the provincial government this week: effective immediately, BC craft brewers are now allowed to serve other BC craft beer in their tasting rooms, as well as BC cider and BC wine. (In contrast, Ontario craft breweries are not only forbidden from selling beer by the glass, they also can only serve beer made in their own brewery.) I expect to see cider being sold at Cumberland in short order — it immediately solves the problem couples have where one person loves beer, and the other person is either gluten-intolerant, or is not a fan of beer. I forgot to ask Mike about water treatment, a subject in which I had a professional interest due to a paper I wrote a few years ago about a theoretical brewery in Cumberland. One of the challenges I noted was Cumberland’s municipal water, which is drawn from a nearby lake fed by glacial melt; glacial ice being pretty darned pure, the water is amazingly free of trace elements. However, that’s not necessarily a good thing for a brewer — to guarantee healthy yeast growth and flocculation, a brewer would usually be looking for calcium (Ca2+) concentrations of 50 to 100 parts per million (ppm) and magnesium (Mg2+) concentrations of at least 15 ppm. Cumberland’s water has concentrations of calcium and magnesium of only 4.7 ppm and 1.2 ppm respectively. While some people might see this as a disadvantage — the brewer has to add calcium and magnesium salts to every batch of beer — I pointed out in my paper that this also allows the brewer to custom build a water profile for each batch of beer. Need a soft water profile for a Plzen-like pilsner? Add this. Need a hard water profile like Burton-on-Trent for a good bitter British pale ale? Add this. Whatever water treatment they use, it seems to be working — the beers all taste good, and locals have clearly made it their local watering hole. The business model of not packaging your beer, but also not going the whole brewpub menu of food & beer route, clearly is not possible in Ontario’s current legal setting,but it looks to be working under BC’s shiny new craft beer rules. I will be watching with interest to see if Cumberland can continue to thrive selling only by the glass and growler. Yes, it’s that time again. The Master Brewers’ Association of Canada (MBAC) has just released the list of ingredients for the 2015 edition of the Iron Brewer competition. For those of you who have joined this channel since last summer, the MBAC provides 15 brewers with identical bags of ingredients. Each competitor must make at least 10L of beer using only the ingredients provided plus brewing water. (Just like Iron Chef competitors don’t have to use every ingredient on the pantry table, Iron Brewers don’t have to use every ingredient in the bag.) The beers are judged, the scores are toted up, and one brewer is crowned the Iron Brewer. Since there are always more than 15 brewers interested, names are drawn from a hat, with the exception of last year’s 1st, 2nd and 3rd place finishers, who are given a bye into the next competition. There may be some additional ingredients added by the end of next week. I have until the end of September to brew at least 10L of beer with only the above ingredients + brewing water. Does anyone have suggestions on what type of beer I should make? Tags: . brewpub, Arbutus Pale Ale, B.C. 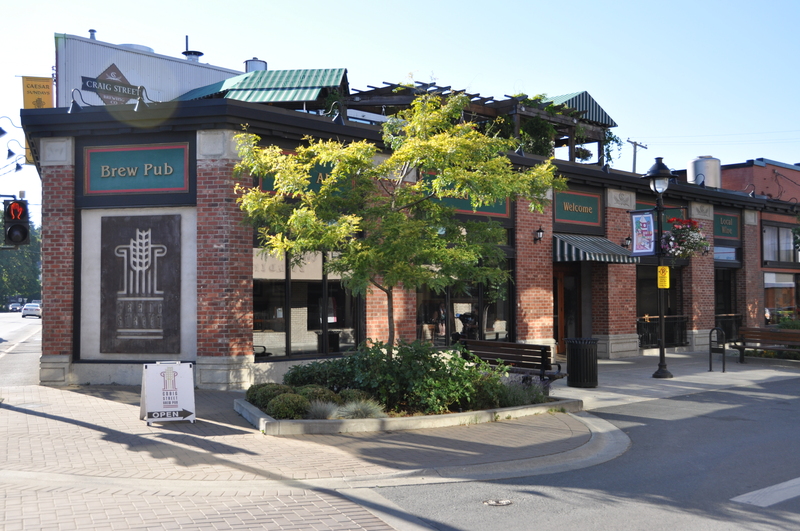 craft beer, Craig Street Brewpub, Fisherman's Wharf, floating house, Swan's Hotel, Victoria B.C. 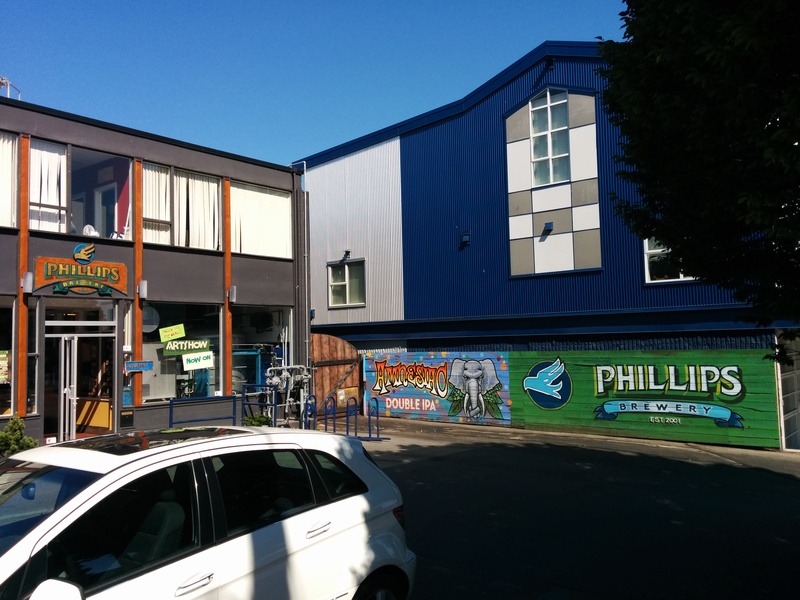 After Elaine dragged me out of Phillips’ tasting room, I checked my list of breweries and brewpubs in Victoria that I hadn’t visited. Hey, only one brewpub remained: the venerable Swan’s Hotel. 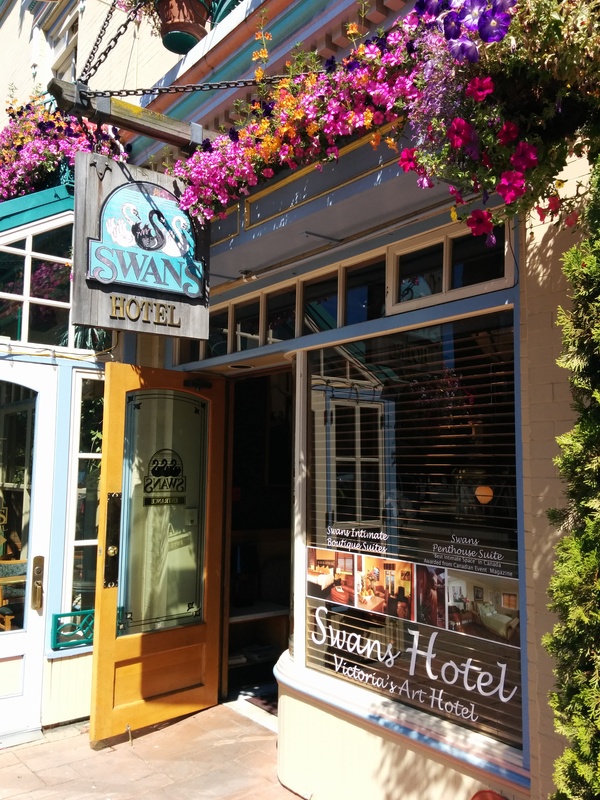 Swan’s, a combination of boutique hotel and brewery, has been around since 1989. In years past, I had quaffed ale in their brewpub, but had never seen their brewing operation. Alas, I never made it past the receptionist. Brewers are busy people, don’tcha know, they can’t just have anyone walk off the street and bother them. No, it really didn’t matter that I write a beer blog. Neither did I gain any traction by showing her my list with every name checked off except Swan’s. So, Swan’s remains on my “to be visited” list. Guess I’ll have to call ahead and make an appointment next time I’m in town. 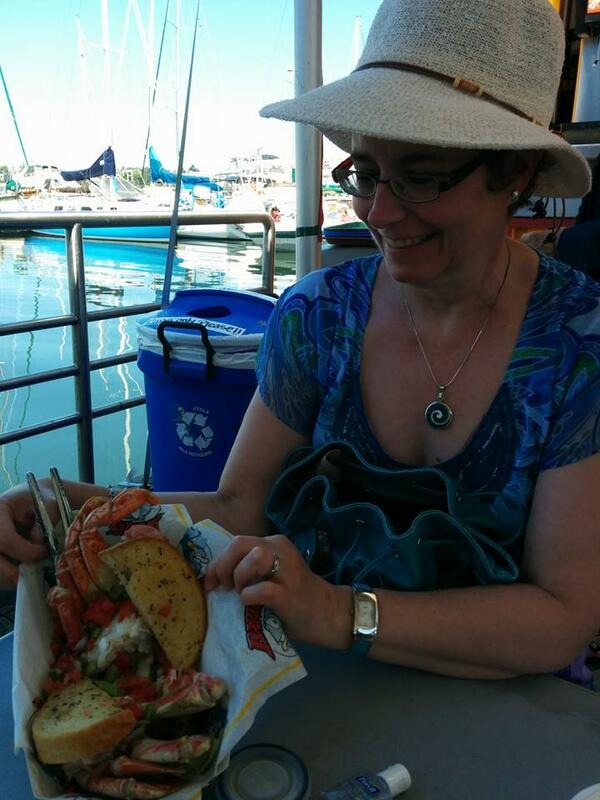 How can one visit Fisherman’s Wharf and not eat seafood? It was still morning, and seemed a bit too early to head back to the Comox Valley, so we drove down to a part of the Inner Harbour called Fisherman’s Wharf. 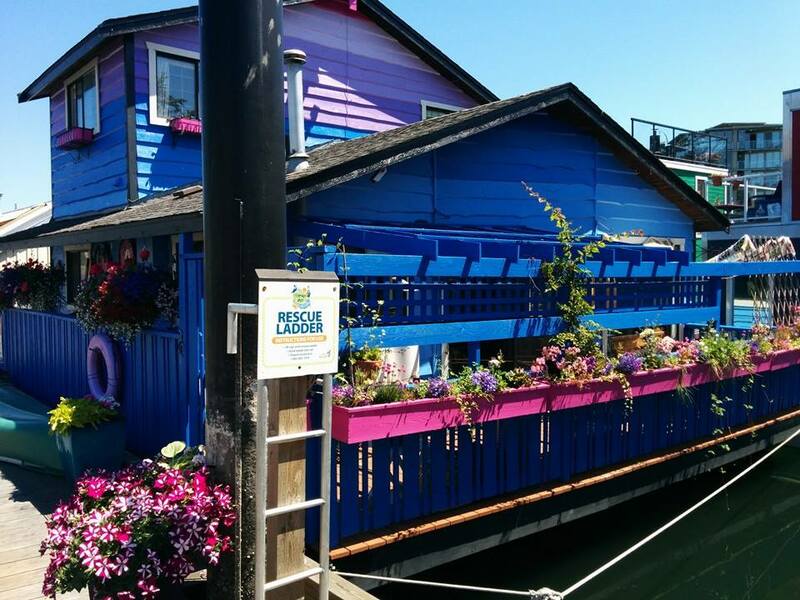 This part of the harbour is home (literally) to several dozen gaily painted floating houses. (“Floating houses”, not “houseboats” — apparently houseboats have their own engine for moving from place to place — these houses have to be towed from mooring to mooring.) We saw one for sale for only $350,000 (plus $970 per month in mooring fees, but interestingly, no property taxes, which makes sense since you’re floating on the ocean). For a brief moment, I imagined myself living down by the Inner Harbour. But there’s all of those pesky tourists (like us) gawking at your house every day and wondering out loud about living down by the Inner Harbour. Besides, was I ready to eat seafood every day? Craig Street Brewpub, on Craig St.
With that in mind, we sat down and ate some seafood. Mmmm, maybe I could live like this. And then it was time to head back up-Island. Of course there was a massive traffic stoppage at the narrow Malahat Pass — a multi-vehicle accident right at the summit of the pass had traffic stopped in both directions for over an hour. In fact it took so long to get over the pass that we decided to stop for some refreshments in Duncan, a small town just north of the Malahat. All hail Arbutus Pale Ale! And where better to stop than Craig Street Brewpub, which predictably is located on Craig Street. Constant readers of this blog will know that when I come across a well-made northwest pale ale, I rejoice. And at Craig Street, there was cause for rejoicing. All thoughts of traffic stoppages were erased by a pint of Arbutus Pale Ale, an unfiltered, aromatic gem. A small pizza and a sharing plate of panko-crusted crab cakes definitely left us gruntled. Unfortunately the Craig Street brewer was not at work when we were there, so all I could do was gaze through the window at the brewhouse, which seemed to be about 10 hL. Everything looked nice and shiny, and I was surprised at how much room the brewhouse and fermenters had. As I have mentioned before, often brewpub equipment is shoehorned into spaces so small, the brewer has to add “contortionist” to his or her resume in order to be hired. Check out the speed limit sign: 120! But alas, we really had to get back to the Valley. 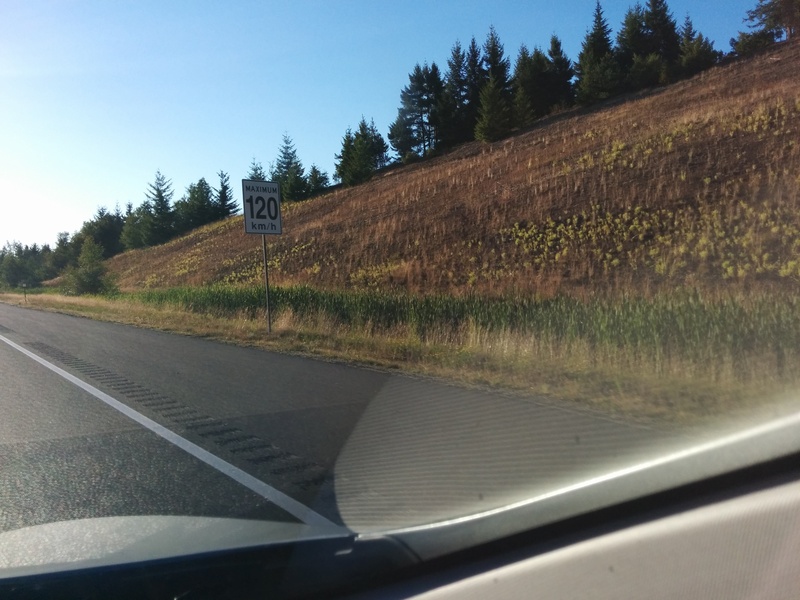 As we hit the long straight stretches of the Island Highway north of Nanaimo, we got a pleasant surprise: the speed limit, which had been 110 km/hr (70 mph) the previous day, had been upgraded overnight to 120 km/hr (75 mph). Wheee! Tags: B.C. 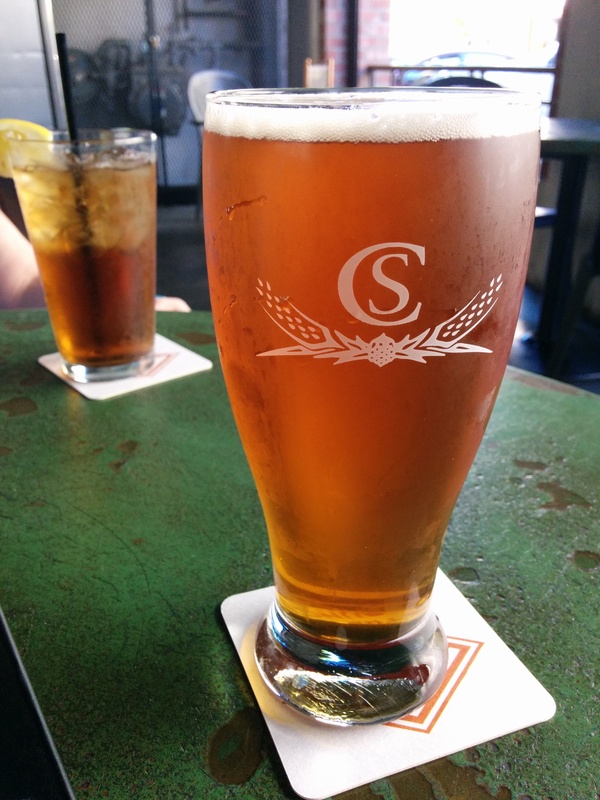 craft beer, Hoyne Brewing, Matt Phillips, Phillips Brewing, Sean Hoyne, Tapa Bar, Victoria B.C. 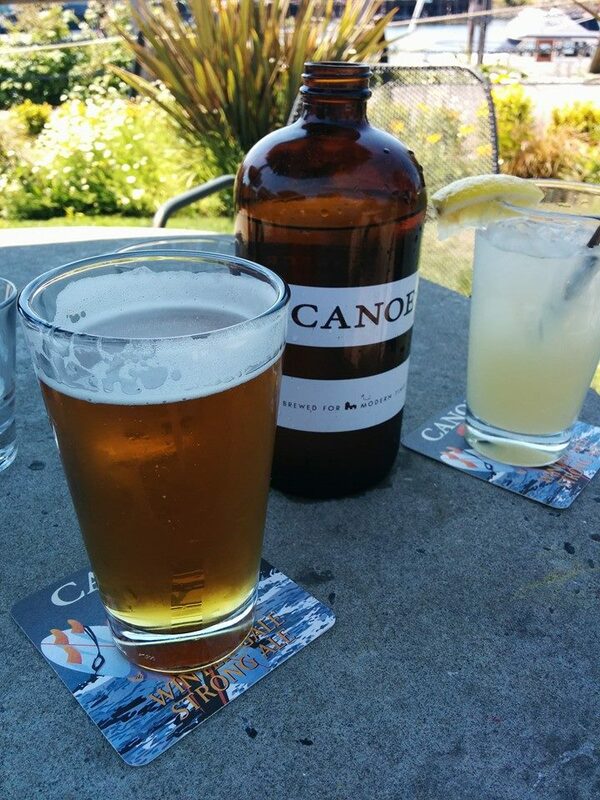 After visiting CANOE and Lighthouse, you might think that I had already enjoyed my fair share of beer and beer talk. And normally you might be right. But here’s something you might not know about Victoria: ALL the downtown shops and stores close at 5:00 p.m. That means there’s very little to do except walk down to the harbour and watch the seagulls. Or look for a restaurant or bar. And drink beer. And talk about beer. Luckily, Elaine & I have experienced Victoria’s early closing hours, and we did what we have done on several occasions in the past: we had dinner at one of our favourite spots, the Tapa Bar in Trounce Alley. Trounce Alley is one of those impossibly cute tourist draws, a narrow Victorian alley chock-a-block with tiny but trendy shops. And the Tapa Bar has been there as long as we can remember, well before tapas (shared plates) became popular. 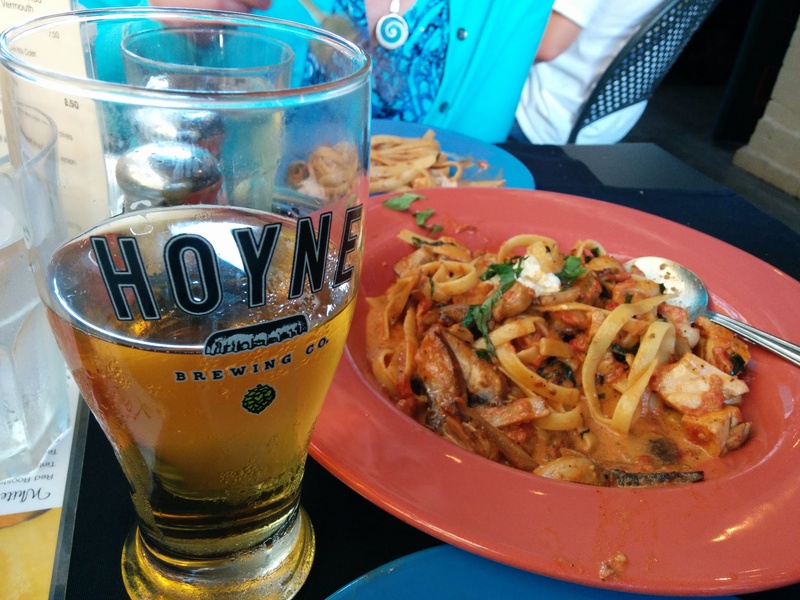 Looking for a good all-round beer that can pair to a lot of Spanish-inspired dishes, I decided on Hoyne Pilsner, made just a few blocks away by Sean Hoyne and his crew. It turned out to be an inspired choice, the crisp noble hops giving an extra oomph to each of the locally-sourced garlic-spiced sharing plates. Our dinner only emphasized how much Victoria (and frankly, a lot of BC) is a foodie heaven. Even in a small restaurant, everything always looks and tastes so good. 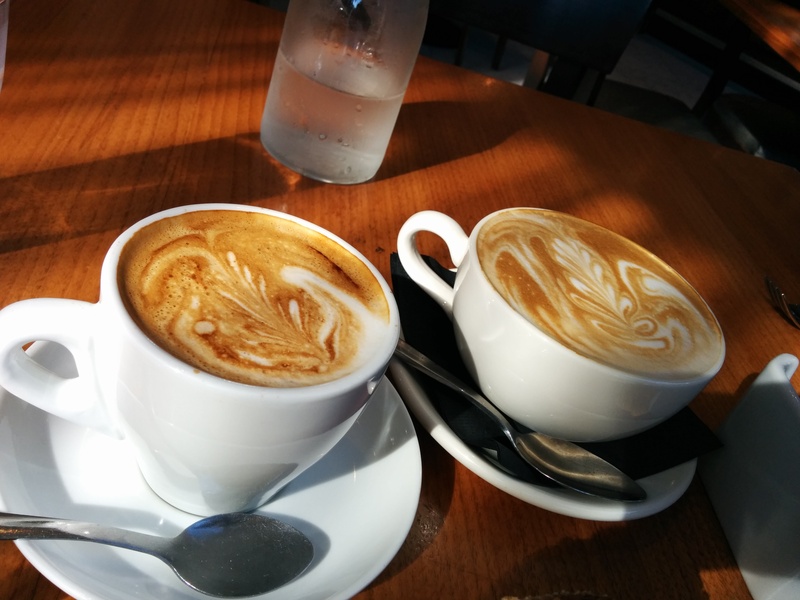 The next morning, even a latte in the hotel bar was presented with a sense of calm perfection. Over our caffeine fix, Elaine discussed what to do and where to go before we had to head back up Island. First up, we decided, would be Phillips Brewing. What is your emergency back-up beer? You know, when you’re in a restaurant that only has the standard mix of American and European lagers courtesy of AB Inbev, MolsonCoors and Heineken? Thankfully, when I’m in British Columbia, I usually don’t have that problem — even in restaurants that don’t carry a lot of craft beer, I often find Phillips Blue Buck on the menu, a well-balanced northwest-style pale ale with a bright nose and a snappy finish with a that goes well with a variety of dishes. It also happens to be Phillips’ best-selling beer. 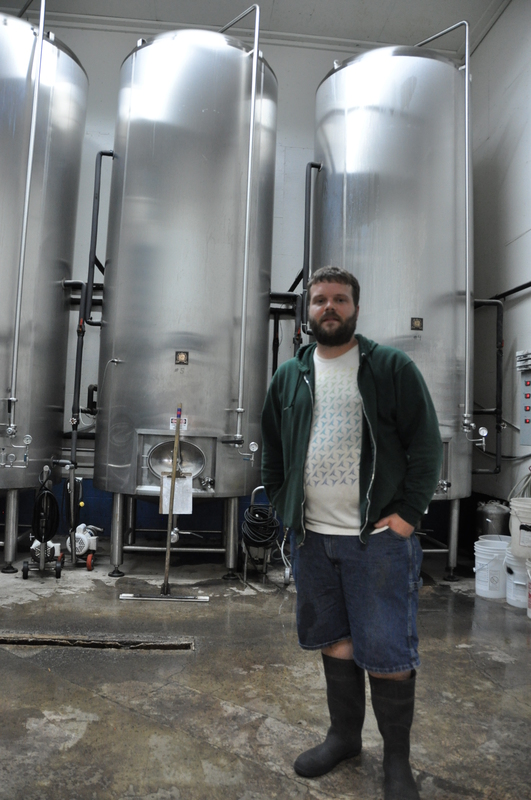 Matt Phillips opened the doors of his new brewery in nearby Esquimault in 2001 as the only employee, and quickly made his hoppy beers a mainstay of the northwest craft scene. Two moves later, and the brewery, now located in Victoria, has over 40 employees. And although the brewery makes many styles, it still has something of a reputation for beautifully bitterness — Phillips brewers have never been afraid to add another handful of hops. Or two handfuls. The exterior of the present location has that funky, eclectic “what should I do with these spare parts?” sort of exterior. 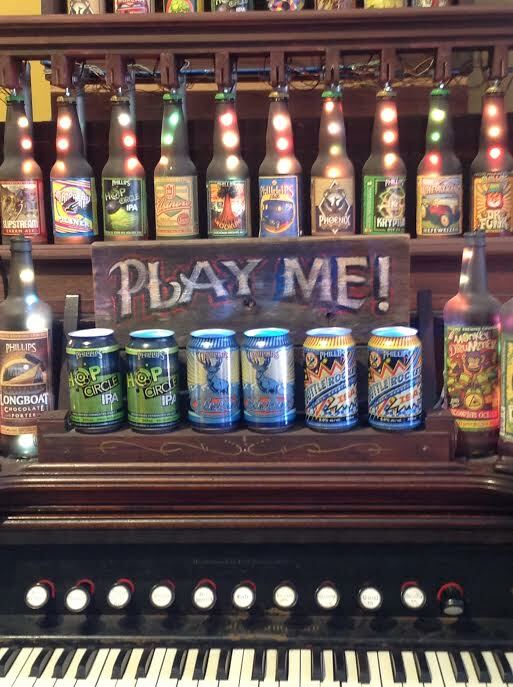 The tasting room is likewise rather funky, complete with an organ made with beer bottles. And although it was empty when we entered at 11 am, that didn’t last for long — over the next thirty minutes, a variety of locals and regulars entered to get their growlers refilled. We were greeted by Matt (not Matt Phillips who had founded the brewery, just Matt), who quickly poured me a sample of beer. Wow, for sure they aren’t afraid to use hops. As a matter of fact, of the 15 beers produced on a regular basis, no less than seven are what you might describe as hoppy. After a few more samples, Matt took us on a quick tour. And what we saw is pretty neat. The 30-hL brewhouse is certainly capable of pumping out a lot of brews each year, but it’s the number of fermenters I found impressive. We counted four rows of them, filling up what seemed to be all available space. In fact, they did take up all the available space — in a major expansion a few years ago, Phillips had to move some of their fermenters outside, something you usually don’t see at a craft brewery. In total, they had 46 fermenters on site when we visited. They also were one of the first Canadian craft breweries to can their beer, added a beautiful Italian rotary canning line during that major expansion. Over the past year, canning has become the fad du jour in Ontario, but was definitely not common at craft breweries even just three or four years ago. Back to the tasting room for a few more samples — Matt seemed determined to get me to taste every one of the current beers on tap, and I have to admit, I didn’t put up much of a fight. Chocolate Porter + Raspberry Wheat. Amazing. I fell to the ground, crying tears of joy. It was with some difficulty that Elaine got me out the door, and only after I had purchased bottles of the Chocolate Stout and Raspberry Wheat in order to reproduce this magical ambrosia for friends and family. Tags: B.C. craft beer, Lighthouse Brewing, Matt Lyons, Paul Hoynes, three-vessel brewhouse, Victoria B.C. I have no idea how I managed to write an entire post about a brewpub and not include at least one photo of their beer, but somehow I did accomplish that feat yesterday when writing about CANOE Brewpub. So here’s a photo of their IPA. The 1-litre container behind it — sometimes called a “Boston round”, a “growlita” or a “growlette” — is actually filled with water, not beer. As you can also see, there were no large sea otters lounging about in the background, at least while I had my camera ready. After lunch, we decided to head over to Lighthouse Brewing. Specifically I wanted to catch up with fellow graduate Matt Lyons, who had just moved out to Victoria after a year at Trafalgar Brewing of Oakville, Ontario. I was interested to see what he thought of life on the West Coast. 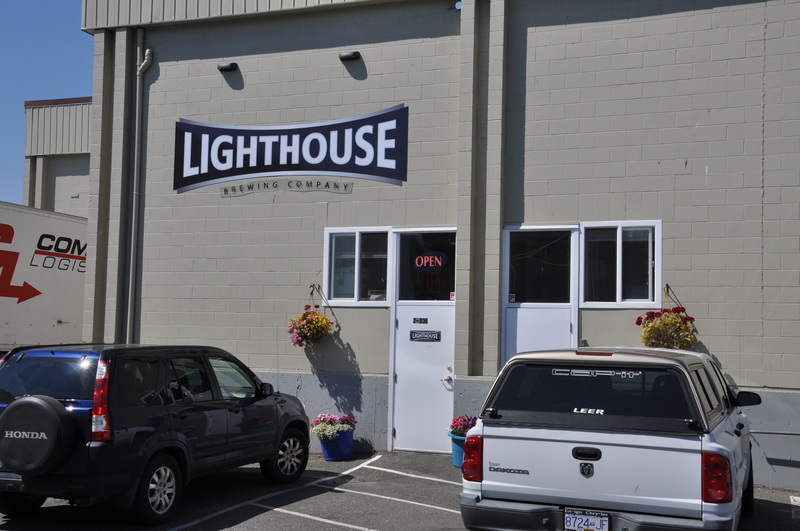 Lighthouse is a 17-year veteran of the BC craft beer scene, founded by brewer Paul Hoyne (brother of Sean Hoyne of Hoyne Brewing). Paul started with a single beer, kegged for sales to restaurants and bars, and quickly expanded to four canned products. Now Lighthouse is a major player in the BC craft beer market and regularly brews eleven mainstays as well as a number of seasonals. Not built for beauty, but man, they make good beer. However, unlike nearby Vancouver Island Brewing, a popular draw with tourists, Lighthouse isn’t built for visitors. Housed in an anonymous industrial building down an obscure alley, Lighthouse is never going to win the prize for most beautiful brewery. But they brew a lot of good beer. Matt was kind enough during a busy day to take us on a tour of Lighthouse, starting with their 25-hL brewhouse. 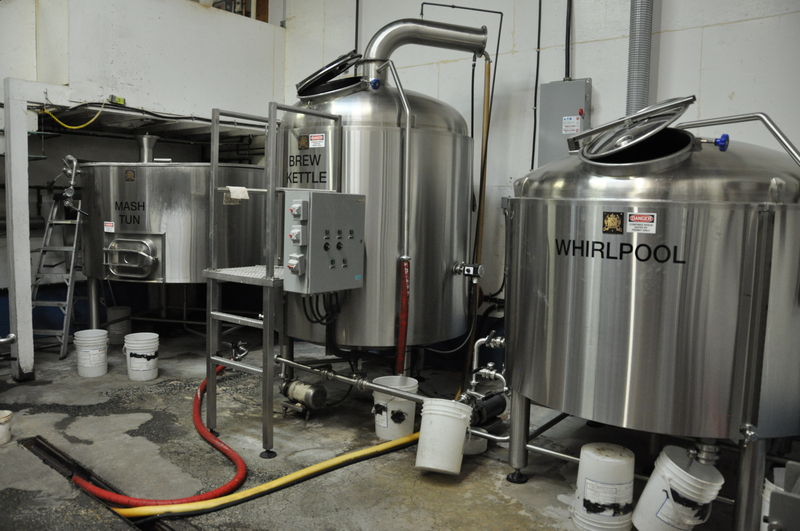 This is a 3-vessel brewhouse: a combined mash/lauter tun, a kettle and a separate whirlpool. 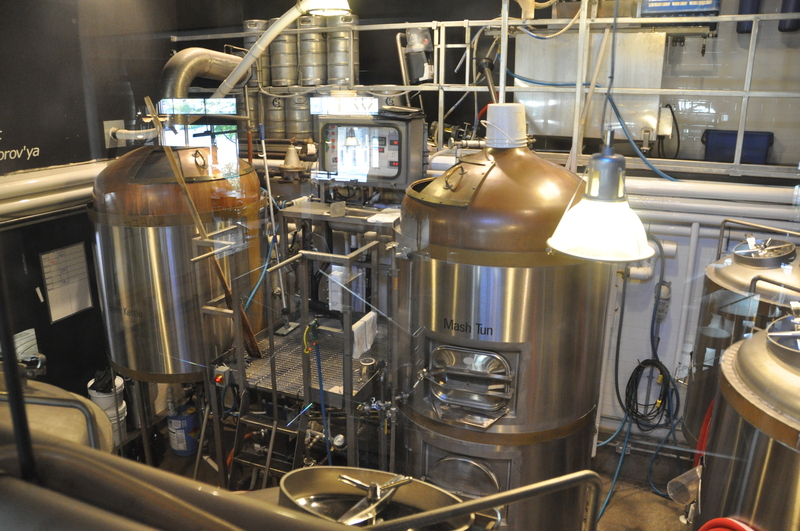 This allows the brewers to make more batches — instead of having to leave the wort in the kettle at the end of the boil in order to whirlpool it (to remove coagulated proteins and hop residue), the brewer can move the wort into the whirlpool vessel, move a fresh batch of wort into the now-empty kettle and save 25 minutes of brewing time. Twenty-five minutes may not seem like a lot, but if you are brewing around the clock, that will allow you to brew several more batches of beer every day. And more beer means more money. 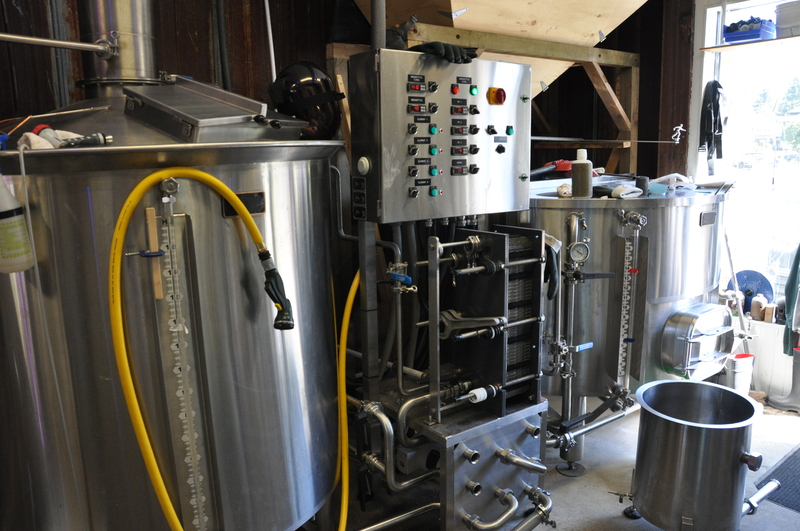 And if you’re going to be brewing more beer, you need fermentors — lots and lots of fermentors. And Matt showed us lots of fermentors, including roomfuls of 25-hectolitre vessels (each holding a single batch) and several quad-batch monsters capable of holding 100 hectolitres. 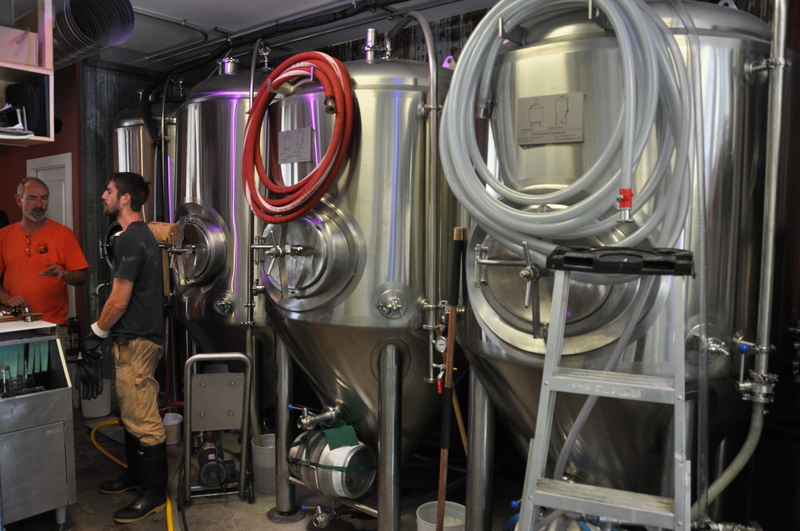 Where there are many fermentors, there’s also lots of cleaning — well, that’s the life of a brewer. Kids, don’t become a brewer if you complain about washing the dishes. And what are you going to do with all that beer when it’s ready? You’d better have a quick way of bottling or canning a lot of beer every day.Yes, Matt showed us the packaging lines, including a rotary filler for bottles. A rotary filler is a neat piece of equipment: empty bottles arrive on a conveyor belt, enter the large wheel, are filled and capped as they make make one revolution and then are shunted down another conveyor belt to be cartoned. Like I said, neat. A lot of moving parts though — I have heard them called an instrument of the Dark Lord by other brewers. 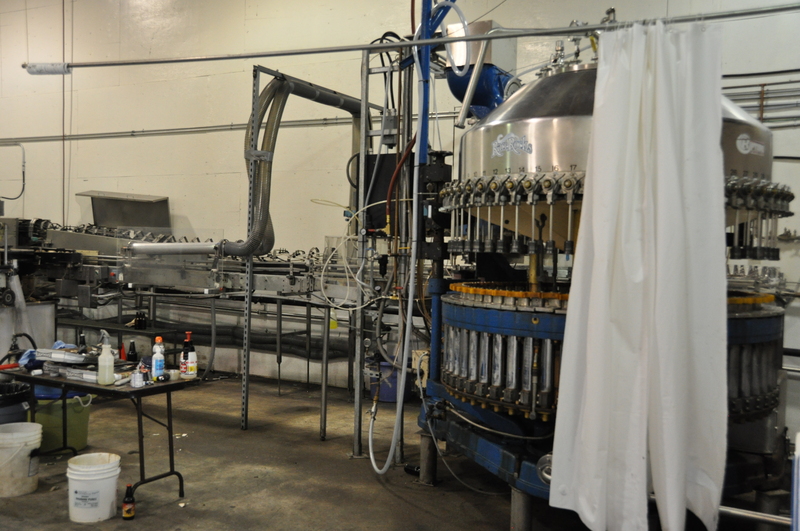 We also saw canning lines, stacks of pallets of cans, cartons of hops — this place is set up to make and package beer. As a postscript, in the time since we visited, Matt has been given the opportunity to develop new recipes for Lighthouse, and one of his beers won a medal at this year’s British Columbia Brewing Awards. Tags: . brewpub, CANOE Brewpub, Hannah Lee, road trip, Victoria B.C. O what a rogue and peasant slave am I! Not only have I neglected this blog as of late, but I realize, to my chagrin, that although I visited a number of breweries in Victoria almost a year ago, I still haven’t written a word about them. So let’s set the Wayback Machine for last July. Elaine & I were again visiting relatives in the Comox Valley on Vancouver Island. Despite the fact that the Valley is the third largest population centre on Vancouver Island, there were NO breweries in the area. 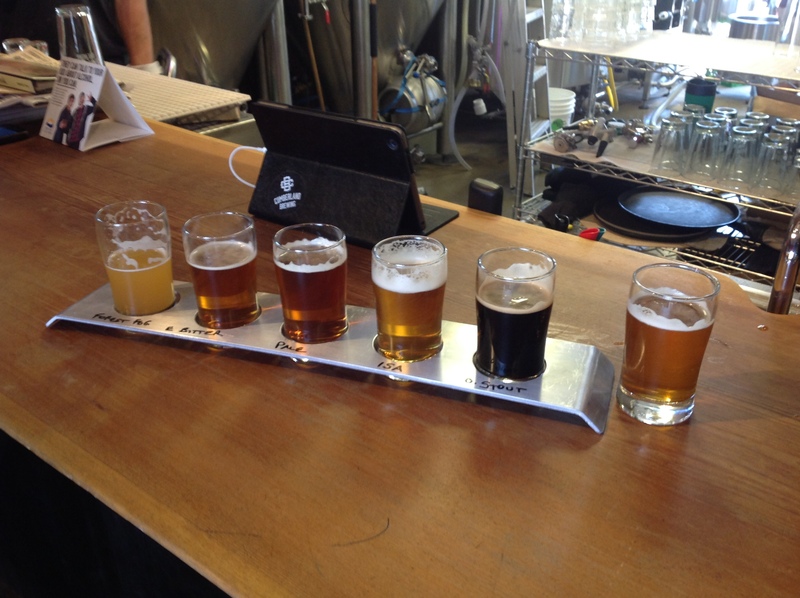 Back in 2013, I had managed to visit about half of the breweries and brewpubs in Victoria. Given the lack of local beer near us, I managed to convince Elaine that we should head down to Victoria for a couple of days to see if we could visit the breweries I hadn’t seen yet. 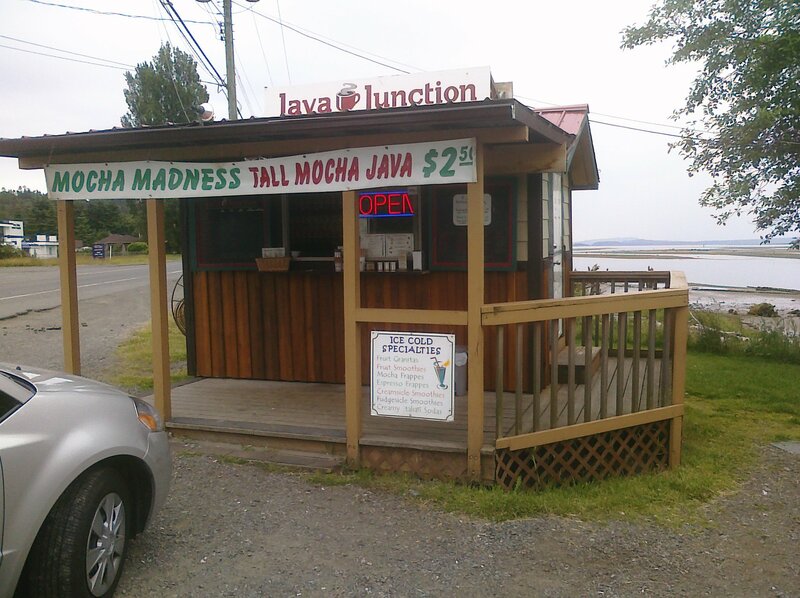 Armed with espresso-based beverages from a small establishment we call Java the Hut, we started early and, aided by the 110 kilometre per hour speed limit, we made the pleasant drive down-Island. When we arrived, it was noon-ish, so what better way to start our visit than with lunch at CANOE Brewpub? 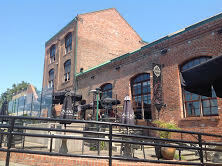 CANOE is housed in a 19th-century warehouse down by the harbour. 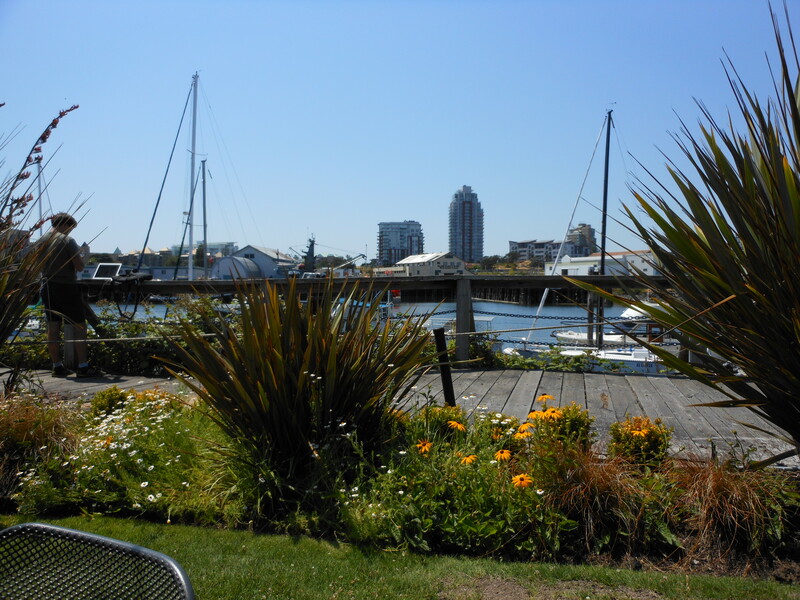 On a warm summer day, with the sun shining down, people walking by on the wooden boardwalk, boats sailing past, and cold beer in front of you, this might be the best place in the city to have lunch. Actually it might be the best place in Canada to have lunch. As if to emphasize this, out of the corner of my eye, I caught a glimpse of brown fur beside us. Expecting to see someone’s dog out for a walk, I turned and realized a large sea otter was gamboling down the boardwalk less than six feet away. Before I could get my camera up for a shot, the otter slid into the water and disappeared. It certainly gave Elaine and I something to chat about while our drinks arrived. I had ordered an IPA, of course — this was the West Coast, after all, and who am I to swim against the tide? The IPA turned out to be very tasty, so I asked our server if it would be possible to speak with the brewer. No, apparently the brewer was not in today. But the assistant brewer was here, would I like to speak with her? Sure. Now remember, I was currently sitting 3500 km (2200 mi) from the college. So imagine my surprise when a few minutes later one of our Brewmaster students, Hannah Lee, appeared at our table. Hannah was on her summer break between the first and second year of the program, and had chosen to come to Victoria to brew at CANOE. 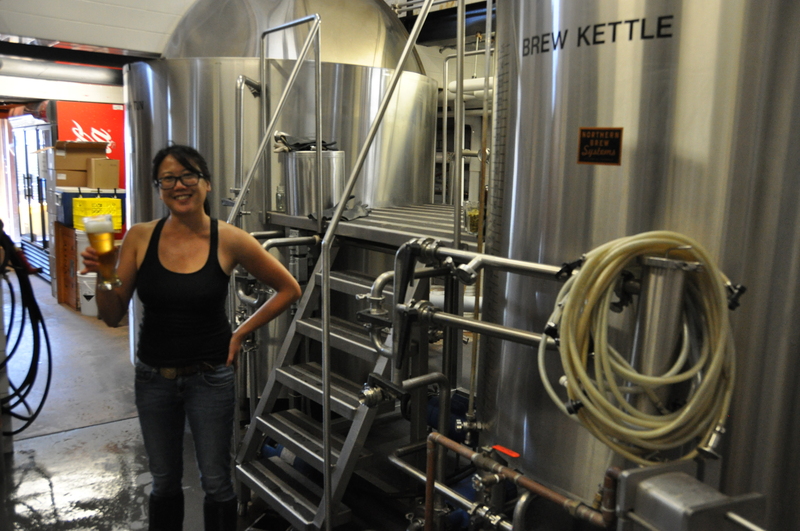 Not only was she brewing for them, she had designed the recipe for a saison that was currently on draft and in the warm summer sun, was selling like the proverbial hotcakes. Hannah Lee in her domain, holding a glass of her saison. Hannah offered to take me on a tour of the brewhouse, so I left Elaine to sit in the sun and watch out for large otters, and headed inside. CANOE has a 20-hectolitre brewhouse, and like several other brewpubs in older buildings that I have seen, it is kind of shoehorned into a small space. Of course the less space the brewhouse takes, the more tables for paying customers you can fit in. Hannah seemed to be having a good time working here, so after tasting some of her saison — I didn’t want to be rude, right? — I said goodbye and headed outside to finish lunch with Elaine. Verdict: great beer, good food, world’s best patio. Although Elaine & I are usually pretty stoic about winter, this past season had an especially vicious bite — week after week of record-cold temperatures, dark overcast skies and seemingly endless snow. Although we do not regularly flee south, this winter proved to be too much for us. 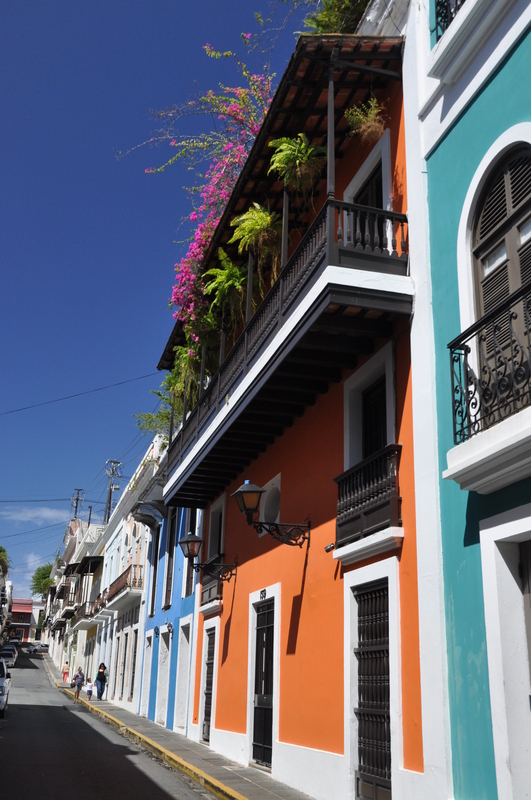 The narrow but colourful streets of Old San Juan. Which is why, a few weeks ago, we found ourselves having breakfast on the rooftop of the Hotel Milano in Old San Juan, Puerto Rico. The modern city of San Juan is a bustling urban centre of over two million people. But right in the middle of the city, on a narrow peninsula lying between the busy commercial harbour and the Atlantic Ocean, lies historic Old San Juan. It’s tiny by any standards, covering an area of only seven blocks by seven blocks. Anyone, at a slow stroll, can cross from one side of OSJ to the other in under thirty minutes. But there’s five centuries of history packed into that small area, including the oldest fortifications and the oldest churches in the New World. 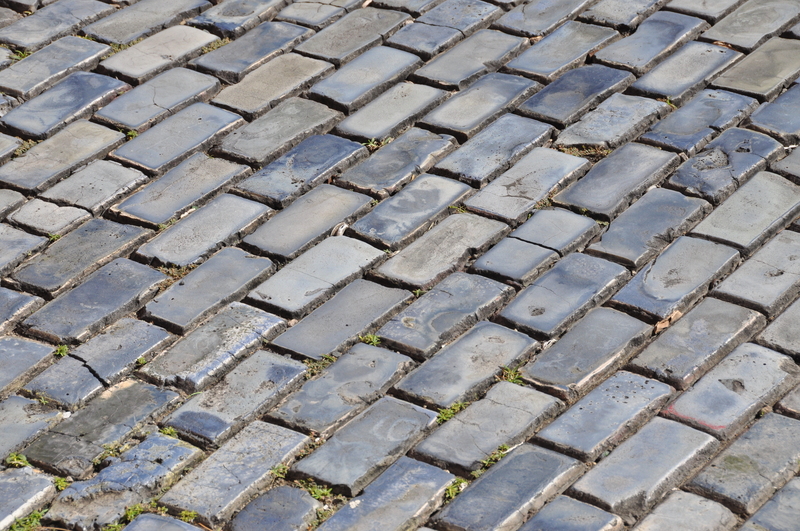 Even the ground has a historic overlay — the narrow streets are covered with blue-glazed cobblestones from Spain, a relic of the ballast stones left behind by Spanish galleons to make room for Aztec gold and Incan silver. So there we were at breakfast, chatting with our server about things to do when somehow — and this seems to happen a lot with me — the conversation turned to beer. Now I confess that my expectations of beer in the Caribbean are not high. If you overlook St. John Brewers, a craft brewery in the U.S. Virgin Islands that makes a killer mango pale ale, the predominant style throughout the Caribbean is yellow American lager, served icy cold. My ears perked up — lúpulo is the Spanish word for hops. How could any self-respecting bar call itself “The Tavern of Hops” and not have interesting beers? 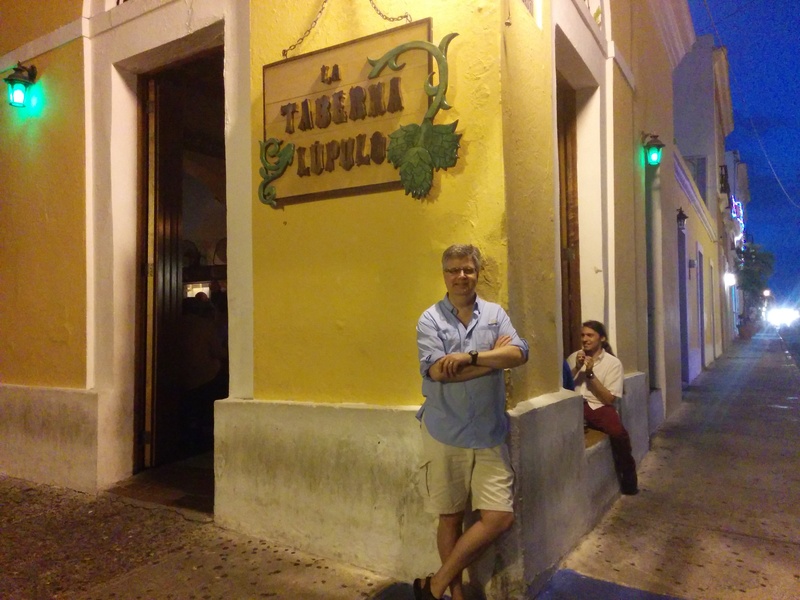 Of course, there was one small obstacle to overcome: the server couldn’t remember exactly where it was, and there are A LOT of bars in Old San Juan. However solving problems like these only adds to the sense of accomplishment, right? So it was that a few hours later, at noon, we were standing on Calle San Sebastiano, outside Taberna Lúpulo. The reason we were standing outside was because it was closed. In retrospect, the chances of the bar being open by noon were slight — Old San Juan is a late night party place that rocks on until just before dawn. Most shops don’t open until after 10 am, and bars only get going at sunset. So it was back out into the narrow streets of OSJ for a few more hours of sight-seeing. Five minutes after opening, the locals are already arriving. Ten minutes later, there is not a seat to be had. But at 6 pm, as the sun was meandering down to the horizon, we found ourselves back at Taberna Lúpulo, and this time, the doors and windows were wide open. And it’s a good thing we got there just as it opened, because not only did we get a nice table by one of the open windows, but ten minutes later, there was not a seat to be had — it’s clearly a favourite with locals. As promised, there were a lot of beers available, up to 48 on tap and another 100 in bottles. The taps were mainly imports from the States (Smuttynose, Victory, Harpoon, Stone, Abita, Founders) as well as a few European imports like La Chouffe and Moretti. The bottle menu also featured a mix of well-known American names and some prominent Belgian breweries. However, I didn’t recognize some of the names. “Hopera?” Over the noise, the barmaid shouted a name at me several times. I finally made out what she was saying: “Hopera Golden Ale by Barlovento. Puerto Rican craft brewery” she yelled. It took me a moment to comprehend that phrase — “Puerto Rico” and “craft brewery” are not normally two phrases that you hear in the same sentence. Turns out Barlovento is brewing beer in the Puerto Rican town of Manati, (30 mi) west of San Juan. 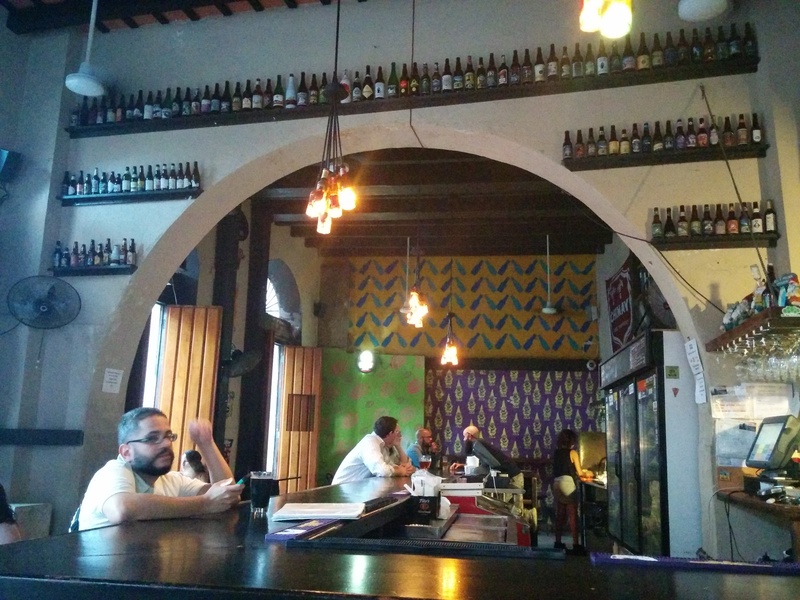 This was good news to me — I didn’t even realize there were craft breweries in Puerto Rico. Seconds later, I was sitting by our open window, contemplating a pint the colour of aged amber, with a wonderful grapefruity citrus nose. The body was light, but firmed up by a good assertive bitterness. Dang, Barlovento hit this one out of the park. Hopera unfortunately had an extremely High Evaporation Rate, and before I knew it, my glass was empty. I wandered over to the bar to look at the list of taps, this time deliberately looking for tap names I didn’t recognize. Dacay Blueberry Chocolate Stout? My life score of Puerto Rico craft beer sightings immediately doubled from one to two. Yep, turns out that Dacay is another Puerto Rican craft brewery, this one in a San Juan suburb. 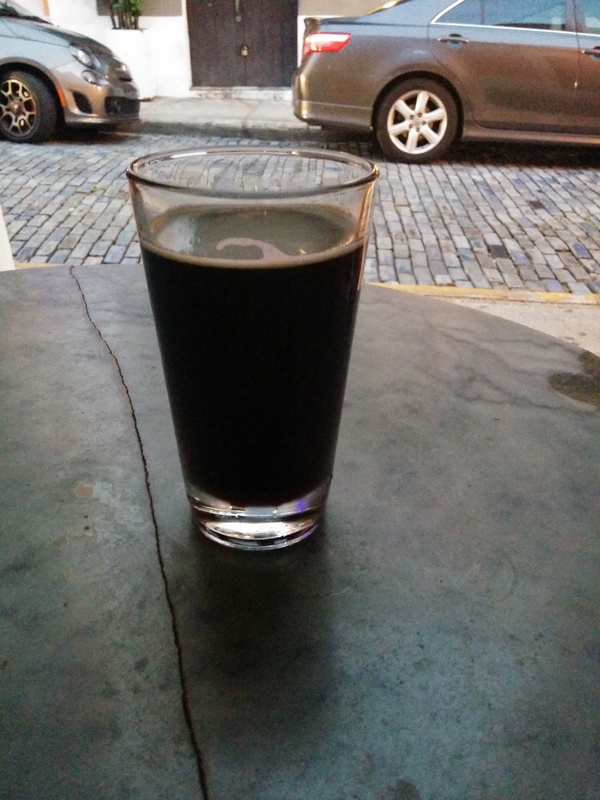 And this stout, a seasonal from Dacay, really was very excellent — light in body, but with a rich smooth fruity chocolate flavour — perfectly in tune with the rapidly darkening streets of San Juan. 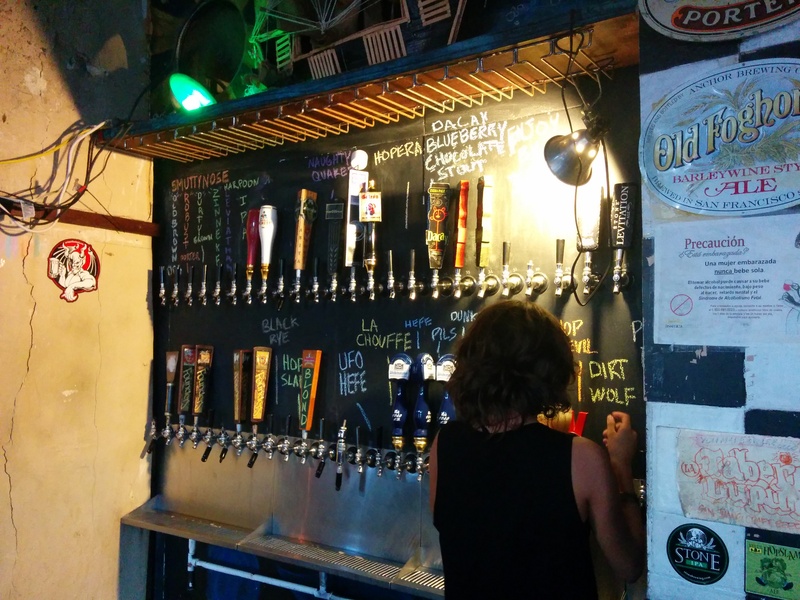 I was really getting to like the craft beer scene in Puerto Rico. However, all too soon, my glass was again empty, and it was time to go. My only regret was, that as we were leaving, I noticed the name the barmaid was writing over a new tap: North Coast Old Rasputin. Old Rasputin on tap?? Seriously?? Dang!! Alas, the tropical night — and dinner — called. 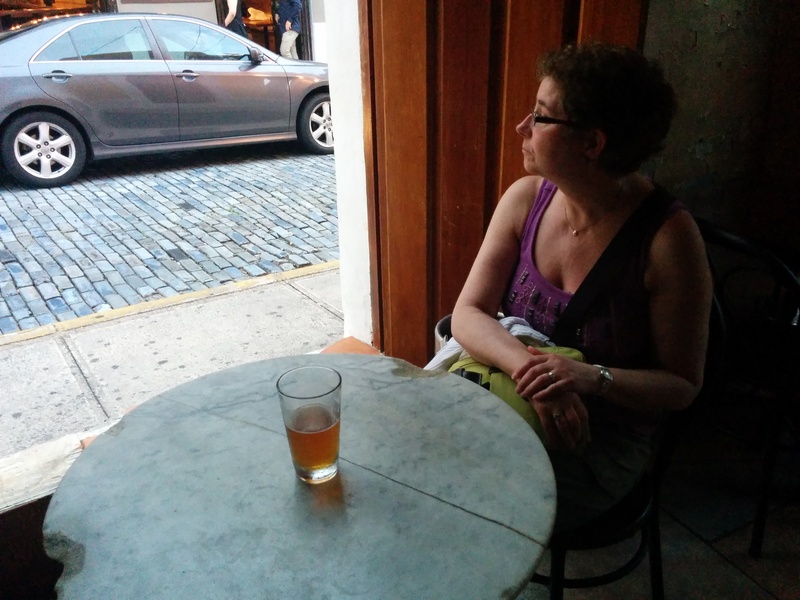 But I’ll be back, Taberna Lúpulo, looking for more Puerto Rican craft beer. And keep a keg of Old Rasputin ready too.